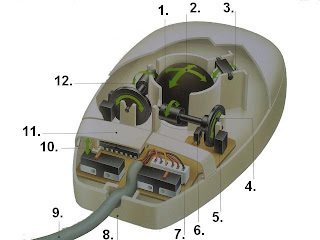 How computers work: How mechanical mouse works? PC or Personal Computer is multipurpose machine built around Central Processor unit.Personal computers cosist of hardware:memory,hard disc drive,mouse,keyboard etc. and software (computer programs).Personal computer enables users to type text,print,surf the internet and so much more.We will try to describe every component that you can find inside your personal computer and provide you with details how each works. Mouse allows quick and easy access to many icons and operations on the computer, such as selecting from a list of possible actions (menu), work with Windows and moving files. when you move the mouse, the rubber ball turns and runs two rollers, both associated with wheel with slots. light-emitting diode (LED) sends light through the slits and transducers convert light into an electrical signal. Pressing the button will send additional information to the computer. 4. Slotted wheel - This wheel with the slots associated with vertical rollers. 3. 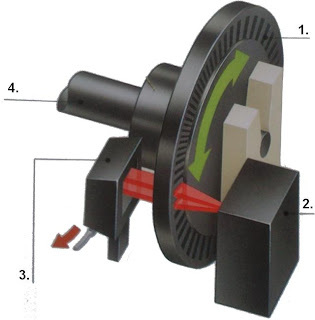 Converter - Converter code flashes of light into electrical signals. 4. Roller Lever - Lever roller transfers spins on the wheel with slits.